Affordability of housing in Canada presents a complex paradox. Canada is considered to be among the more affordable places in the Global North to live, with 80% of Canadians being served by market-based housing, which includes individual home ownership and private rental housing. 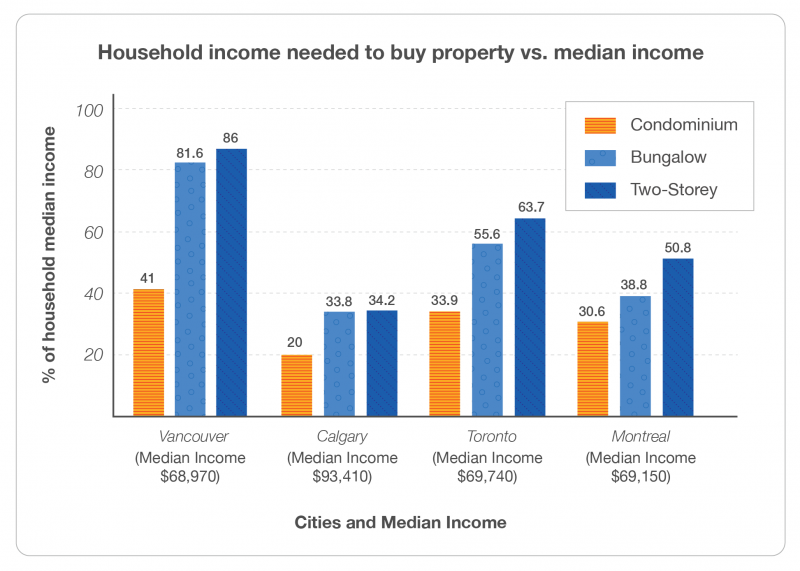 However BC and specifically Vancouver do not fare well in this national picture of affordability. The rising inequality gap of affordable housing presents a significant challenge for BC households who are priced out of rental and ownership housing markets. Statistics Canada reported that while Canada’s real GDP) per capita increased by about 50% between 1980 and 2006, and the average earnings among the top 20% of full-time full-year employees grew by 17.9%, among those in the bottom 25% of the distribution average earnings decreased by 13.3% (Statistics Canada, 2006). Lack of affordable housing is one of a number of complex factors that leads to homelessness (Hulchanski, 2009). According to the urban planning think tank Demographia (2014), says Metro Vancouver has the second-highest housing prices in the world. The research compared urban areas with over one million residents in OECD (Organisation for Economic Co-operation and Development) countries around the world, and Vancouver came out second when income and cost of housing were compared. Blame has been placed on Vancouver’s strong urban containment policies (Hutton, 2004), which are said to have caused the city’s affordability to deteriorate markedly. The average house price in Metro Vancouver is $670,300, which would require 80% of the average median household income to service the mortgage. Vancouver is seen as a very desirable city to live in, and therefore it comes with a cost. This situation is not limited to Greater Vancouver as the Demographia research shows that Victoria, Kelowna and the Fraser Valley are also some of the most unaffordable places in Canada. Case Study 2: Housing Affordability by Geography Open Textbook Collective is licensed under a Creative Commons Attribution 4.0 International License, except where otherwise noted.